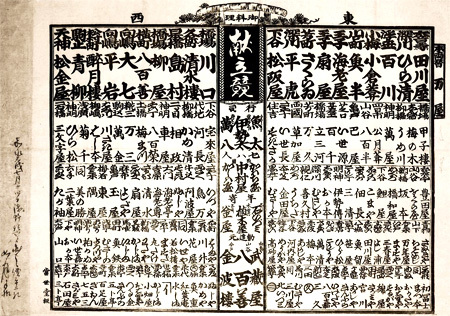 This database searches for and displays the Edo and Tokyo related documents on this site by document type and keyword. This is a ranking list covering serious restaurants within Edo. Promoters include "Yaoya Zenshirō" also known as "Yaozen", an owner of the high-end restaurant that was loved by many educated men. 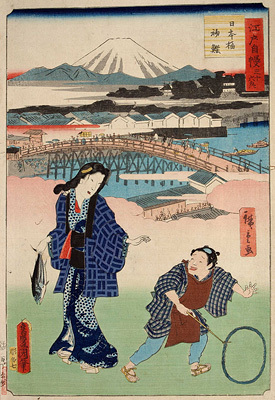 This is a picture that truly shows the "pride of Edo", together with Nihonbashi, a symbol of the city of Edo, hatsugatsuo, the first bonito of the season much adored by the residents of Edo and their admiration was such that a senryū was composed, "Hatsugatsuo / to pawn one's wife for this is / a worthwhile exchange". © 2011 Tokyo Metropolitan Library. All rights Reserved.